… boy was it a busy one! We incorporated, welcomed 5 new members of staff, exhibited and presented at a whole host of events across the country and towards the end of the year launched our 175 Hero campaign for 2016 – our 175th anniversary! A big focus for us across the year was pre-registration trainees – a demographic of service users that has steadily risen over the past few years – whose emails, LiveChats and calls amounted to almost a third of all enquiries received by the charity. Analysis of the issues this group contact us about was conducted and a report of our findings will be published early 2016. On the digital side of things, our website saw a 92% increase in visits and the number of e-news subscribers rose by 70%. We also recently added to our social media portfolio and joined Instagram, meaning potential service users and supporters can engage with us on a regular basis and keep up to date on our activities via Facebook, Twitter, LinkedIn and now Instagram. 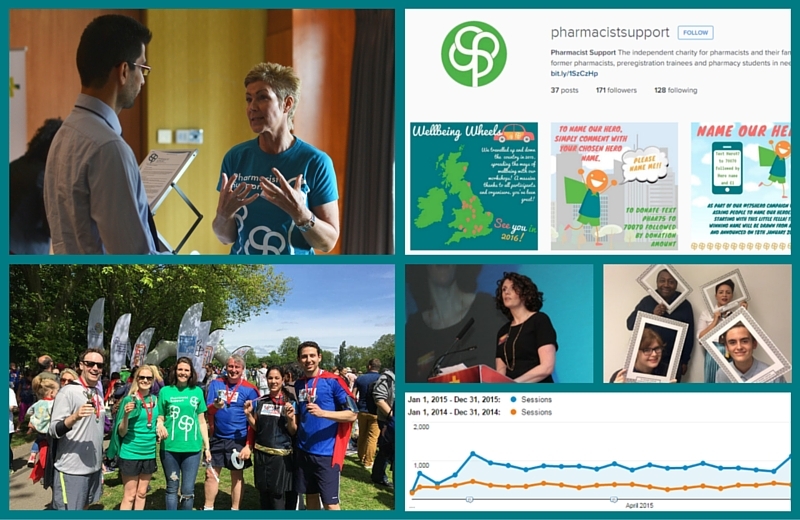 Pharmacist Support was the nominated charity at a number of events over the course of the year, including the SMART Awards, Clinical Pharmacy Congress, UKCPA & GHP Conferences, C+D Awards, Pharmacy Show and North Wales LPF annual wine tasting event. The British Pharmaceutical Students’ Association and Community Pharmacy West Yorkshire also signed up as 175 Hero organisations naming us as their charity of the year. On top of this we managed to raise money through 3 fun runs – the Superhero Run in May, as well as both the London and Manchester Santa Runs in December! In total 2015 saw supporters raise funds of over £57,000, a 90% increase on 2014! Following a successful pilot in 2014, 2015 was the first year of our national bursary scheme – an award for MPharm students (entering their final year of study), who demonstrate outstanding and exceptional qualities to overcome an ongoing adversity, financial hardship, sound academic performance and who are expected to make a positive and excellent contribution to pharmacy in Great Britain. In May 2015 8 bursaries were awarded totalling £34,000. We look forward to following the journeys of these recipients as they progress into their training year and beyond!